This styling kit from Vidal Sassoon includes all the necessary styling elements for just about any look desired. The ionic styler boasts 1000 watts of power and delivers soft, shiny hair. 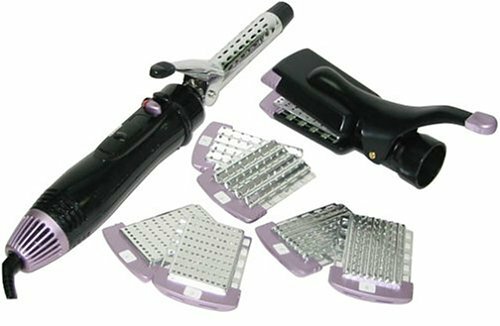 The kit comes with four sets of interchangeable styling plates--crimp, wave, and straight--and three interchangeable attachments--a concenctrator, a straightener, and a styling iron. Additionally, you can set it to two heats and two speeds, as well as turn ions on or off. I love this thing!! I have wavy, thick, short hair and it cuts my styling time in half! I find it especially useful for straightening and twisting the ends of my hair outward. I love this to straighten my hair, but I just can't get the rest to work very well. I would probably do the crimping better if it was just a hot iron. But, I love to dry and straighten my hair with it!!! The best straightener I've ever used. This product is by far the best of anything I've ever tried -- it takes me now 10 minutes to dry and style my hair, instead of more than an hour with other hair dryers/straightening irons. The straightening attachment actually blows hot air through its plates while you straighten, so it's drying it at the same time -- that seems to be the magic trick that makes this product so effective. It's incredibly simple to switch the attachments. And, as an added bonus, it's easy to pack for those who travel frequently. JUST GO WITH THE RATINGS ON THIS PRODUCT! If you liked the old Jet-Aire appliance- this is for you! Great one of a kind product!!! !